While not as immediately eye-catching as the dinosaurs, the fossil mammals on display at the National Museum of Natural History are notable for their sheer diversity. From rabbits to elephants and from bats to whales, virtually every major group of North American mammals, particularly eutherian (placental) mammals, is represented. By my count, there were no less than 48 mounted mammal skeletons on display (not including individual skulls and other parts) in 2014, arranged by time period and distributed across three sizable halls. The comprehensive nature of these exhibits is largely thanks to C.L. Gazin, head curator of the Division of Vertebrate Paleontology in the 1950s and 60s. During the modernization of the fossil halls in the early 1960s, Gazin focused his efforts on assembling a complete narrative of Cenozoic mammal evolution. The six-part exhibit debuted in 1961 in Hall 5, and was relocated two decades later to Hall 3. Gazin also initiated the construction of the adjacent Ice Age exhibit, although it would not be permanently opened to the public until 1974. Now that the fossil halls are being renovated, NMNH staff face the enormous task of disassembling and restoring the dozens of historic mammal skeletons. Many will return when the exhibit reopens in 2019, but others may be retired to the collections if they are deemed too fragile for continued display, or if they are not illustrative of the story being told in the new exhibit. This Megaloceros has the distinction of being the Smithsonian’s first mounted skeleton composed of original fossils. Photo by the author. 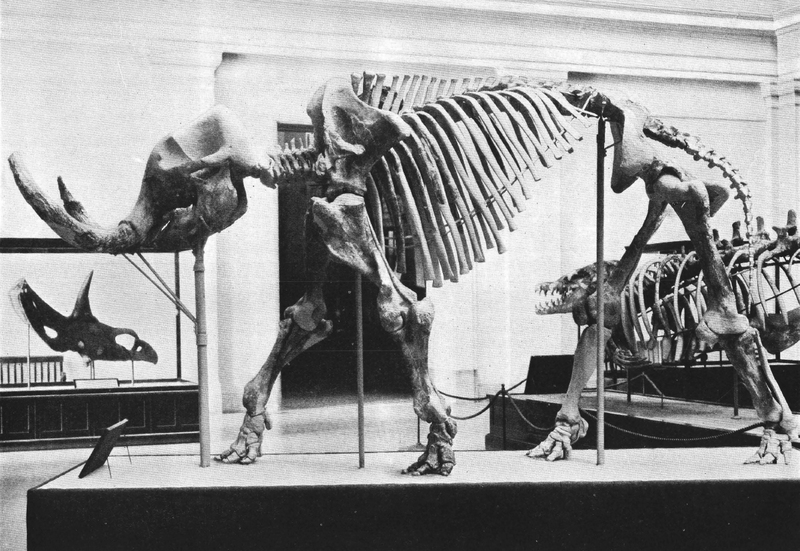 The Smithsonian’s first mounted fossil skeletons went on display in 1871 in the building colloquially called “the castle.” The exhibit included plaster casts of the ground sloth Megatherium, the tortoise Colossochelys and the glyptodont Scistopleurum, all made from originals at the British Museum. The following year saw the addition of the giant deer Megaloceros (USNM V 7051) — the Smithsonian’s first mounted skeleton composed of original fossils. The Smithsonian purchased this complete Megaloceros, which was uncovered in an Irish peat bog, from Philadelphia-based antiques dealer Thomas and Sons. The mount was assembled by none other than Benjamin Waterhouse Hawkins, the sculptor who created the famous Crystal Palace dinosaurs. 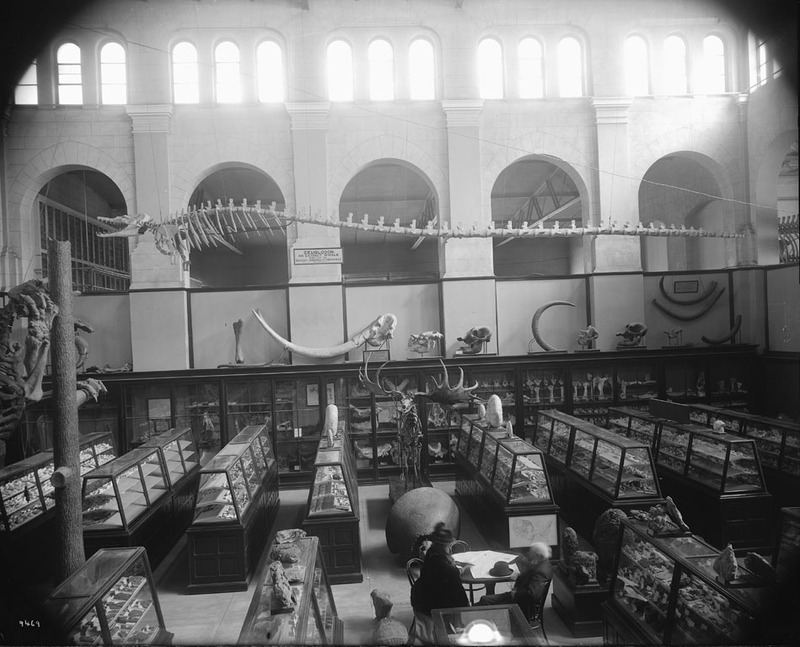 When construction of the original United States National Museum (what is now called the Arts and Industries Building) was completed in 1881, all of the fossil displays were moved to the new setting. Vertebrate fossils found a home in the 80,000 square foot southeast court. Gradually, the Megaloceros and British Museum casts were joined by many more crowd-pleasing skeletons, including a copy of the Philadelphia Hadrosaurus, an Edmontosaurus, a Triceratops, and a mastodon (discussed below). By the time the USNM was preparing to move to yet another new building across the national mall in 1910, the southeast court had become quite crowded. Unfortunately, the Megatherium and Collossochelys never made it to the new location. These casts were discarded due to the damage they had accumulated while on display. Although the glyptodont cast was still on exhibit as of 1940, it too was eventually destroyed. Happily, the Megaloceros survived, and has been included in each subsequent iteration of the fossil exhibits. 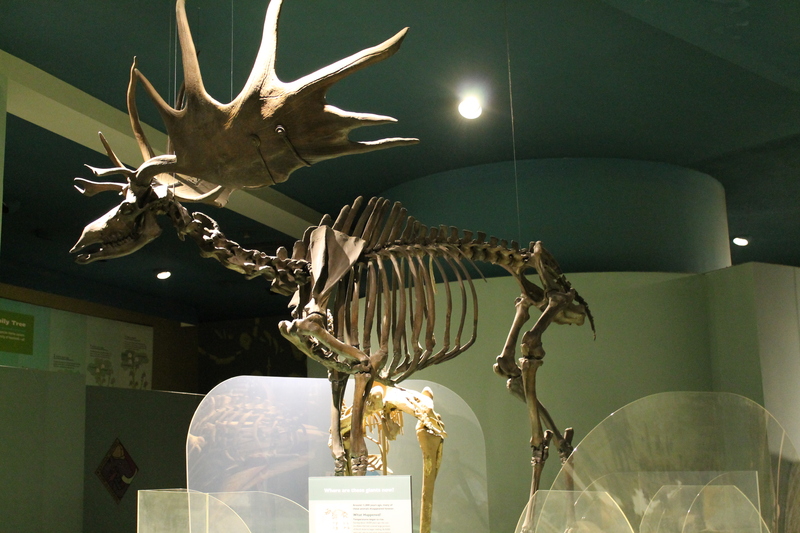 Starting in 1974, the Megaloceros was displayed alongside the extinct bird Diornis in the Ice Age hall. It’s weight was partially supported by cables descending from the ceiling, which proved to be a problem when it came time to disassemble it in July 2014. Rather than attempting to lift the delicate skull and heavy antlers off the armature, the exhibit team strapped the skull to a mechanical lift so that it could be slowly and gently lowered to the floor. In the new National Fossil Hall, the Megaloceros will be sitting on the ground. This pose was selected in order to bring the spectacular antlers to visitors’ eye level. 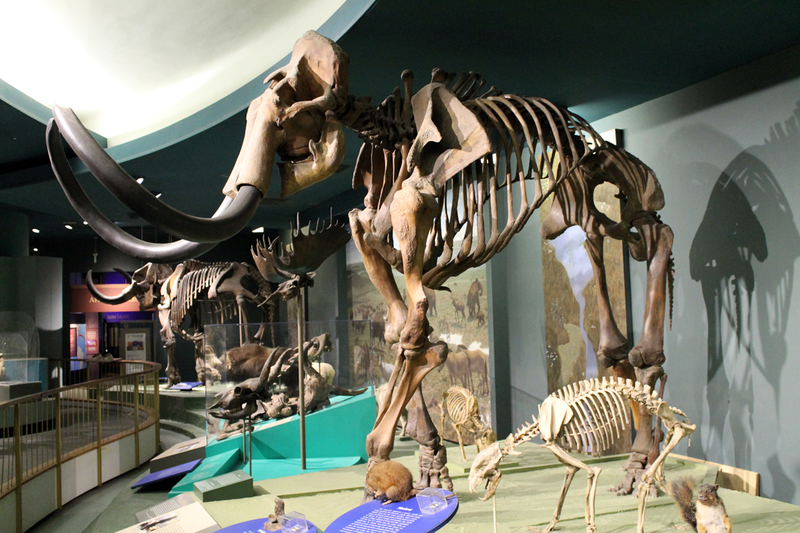 The Indiana mastodon in the Hall of Extinct Monsters. Photo courtesy of the Smithsonian Institution Archives. In 1901, Michigan farmer Levi Wood found a well-preserved, nearly complete Mammut americanum (USNM 2106) in a peat swamp on his land. The USNM purchased the rights to excavate the skeleton from Wood and began work that same year. The specimen turned out to be virtually complete, save for the forelimbs and left hindlimb. Alban Stewart mounted the skeleton, adding a left hindlimb from another mastodon specimen from Missouri, and filling in other missing elements with plaster replicas. The completed mount was first exhibited at the Louisiana Purchase Exposition in St. Louis, Missouri in 1904. For a time, there were two mastodon mounts on display in the Hall of Extinct Monsters. Photo courtesy of the Smithsonian Institution Archives. After the Exposition, the Michigan mastodon was added to the fossil displays in the southeast court of the Arts and Industries Building. It remained there for four years, before joining the rest of the paleontology exhibits and collections in the move to the new USNM building. 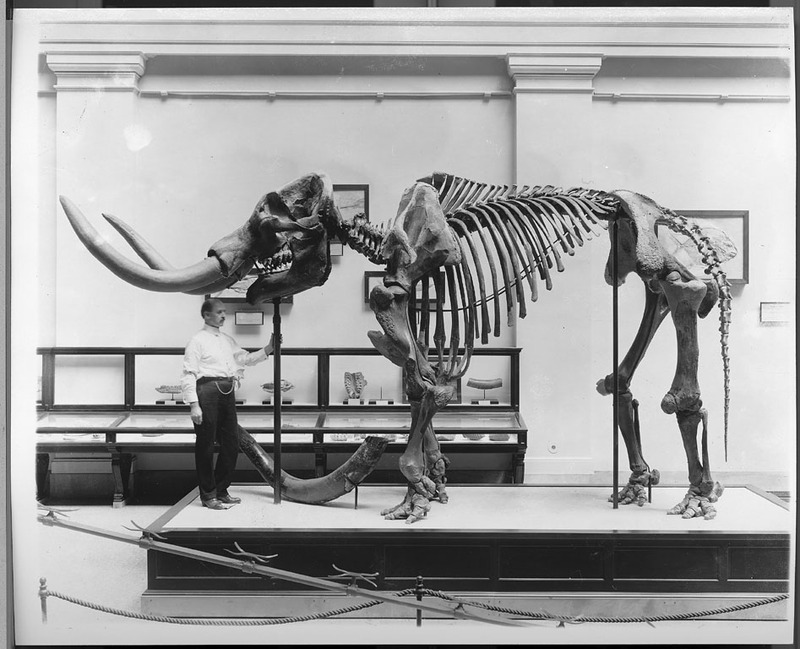 In 1915, a second mastodon (USNM V 8204) from Indiana was added to the Hall of Extinct Monsters. The matching set can be seen on the left side of the image above, with the plaster skull of a Deinotherium (USNM V 1917) positioned between them. The larger Indiana mastodon persisted through the 1963 and 1981 renovations, and will return with a more energetic pose in 2019. NMNH loaned the Michigan mastodon to the Oregon Zoo for many years. It has since been returned, dismantled, and retired to the collections. Stegomastodon in 2014. Photo by the author. The young male Stegomastodon (USNM 10707) was collected by James Gidley and Kirk Bryan collected this skeleton in the San Pedro Valley of Arizona. This 1921 collecting trip also produced the museum’s Glyptotherium. While the genus Stegomastodon was erected in 1912, Gidley referred his specimen to a new species, S. arizonae, due to its more “progressive” physiology and slightly younger age. 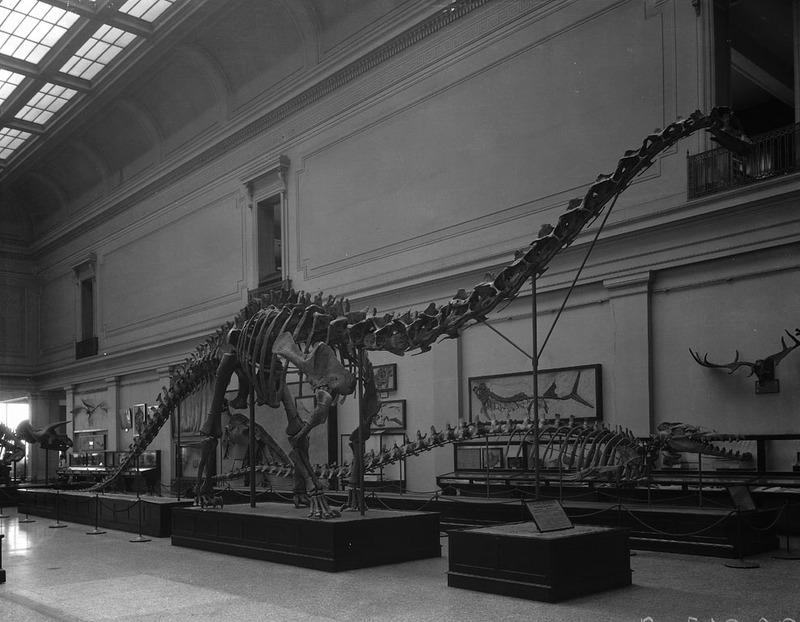 By 1925, the skeleton was mounted and on display in the Hall of Extinct Monsters. While the original mount used the real fossil tusks, these were eventually replaced with facsimiles. Stegomastodon with its original tusks. Photo from Gidley 1925. The Stegomastodon will not be returning when the National Fossil Hall reopens in 2019. For one thing, there are already two big elephants on display: the mammoth and the mastodon. Elephants take up a lot of space, and a third proboscidean offers diminishing returns when compared to the amount of floor space it requires. More importantly, the Stegomastodon is a holotype specimen, and the exhibit team elected to remove most of these important specimens from the public halls. This is both to keep them safe from the damaging effects of vibration, humidity, and fluctuating temperature, as well as to make them more accessible to researchers. The unique and impressive Eremotherium pair. Photo by the author. 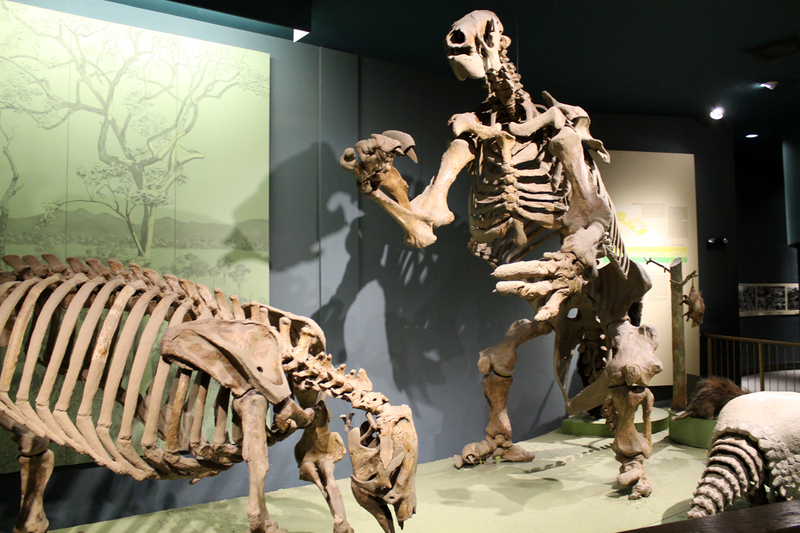 The immense pair of giant ground sloths (USNM V 20867 and USNM V 20872) are among the most impressive and unique skeletal mounts at NMNH. Many a visitor has ascended the ramp to the Ice Age gallery only to stop and stare at them. Unlike the Megaloceros, mastodon, and many others, these were new additions added during the 1960s modernization. Gazin’s team recovered the fossils in Panama between 1950 and 1951, bringing back over 100 plaster jackets representing at least eight individual sloths of the genus Eremotherium. Assistant Curator of Cenozoic Mammals Clayton oversaw the assembly of the two Eremotherium mounts in 1969. Both the larger standing sloth and smaller kneeling one are composites of fossils from many individuals (there are also plenty of reconstructed bones, easily spotted by their solid beige coloration). Most of the surplus bones were repatriated to Panama before the mounts went on display. The sloths were originally positioned back-to-back on a central platform, accentuated by an illuminated opening in the ceiling. However, this layout only lasted a few years. In 1974, the Quaternary Hall was completely reorganized into the Hall of Ice Age Mammals and the Age of Man. In the new arrangement, the Eremotherium pair was relocated to a corner at the north end of the gallery. In 2019, only one Eremotherium will be on display. 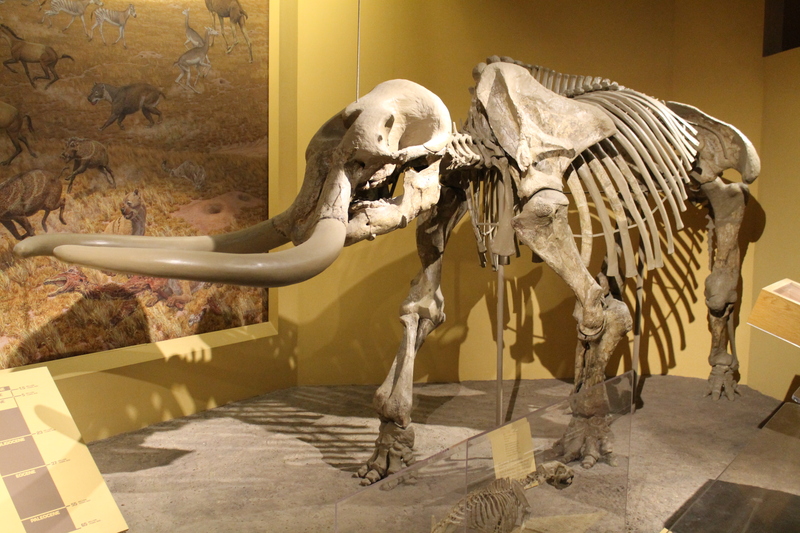 This mammoth was assembled from as many as 70 individual specimens. Photo by the author. Although it was always labeled as a woolly mammoth (Mammuthus primigenius), the Smithsonian’s third proboscidian skeleton (USNM V 23792) is actually a composite of over fifty individual specimens, some of which probably belong to the more southerly Columbian mammoth (Mammuthus columbi). Most of these fossils were acquired in a trade with the American Museum of Natural History in the 1960s, specifically to build a mounted skeleton for the Ice Age hall. Perhaps because they were acquired for display, rather than study, the origin of these fossils was not well-recorded. It is only now that the mammoth has been disassembled that collections staff can begin to to learn more about this iconic chimera. Some of the bones are marked with the year and location of their collection, crucial details for piecing together their provenience. Experts can also determine whether this mount is more primigenius or columbi, and decide if a composite like this is even appropriate for continued display. The mammoth in its new, snow-shoveling pose. Photo courtesy of the Smithsonian Newsdesk. 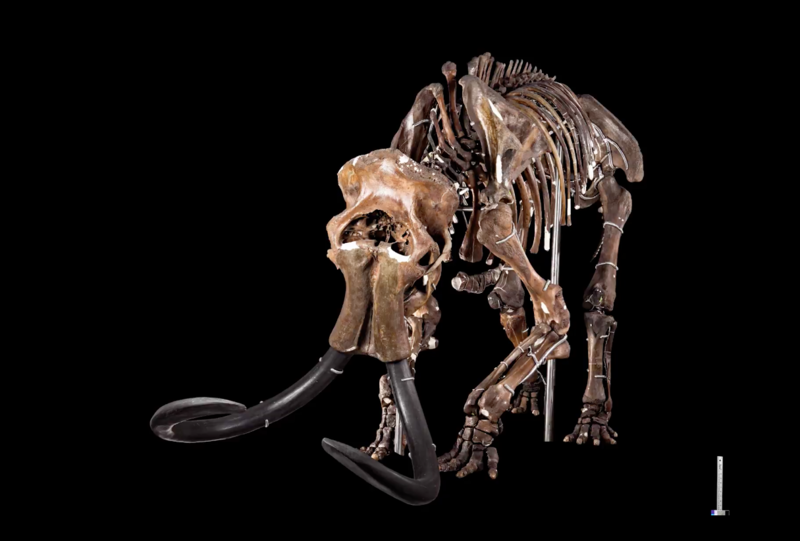 In the new fossil hall, the mammoth will be kneeling down, pushing its great tusks across the ground as though it were brushing away snow. In the meantime, the original mount was digitally scanned, and the model is freely available from Smithsonian 3D. Carrano, M. 2018. Pers. comm. Gazin, C.L. 1956. Exploration for the remains of giant ground sloths in Panama. Smithsonian report, 341-354. Gidley, J.W. 1925. Fossil Proboscidea and Edentata of the San Pedro Valley, Arizona. Shorter Contributions to General Geology (USGS). Professional Paper 140-B, 83-95. Gilmore, C.W. 1906. Notes on Some Recent Additions to the Exhibition Series of Vertebrate Fossils. Proceedings of the United States National Museum No. 30. Gilmore, C.W. 1941. A History of the Division of Vertebrate Paleontology in the United States National Museum. Proceedings of the United States National Museum No. 90. Upon his death in 1829, British scientist James Smithson left his fortune to the United States government to found “at Washington…an establishment for the increase and diffusion of knowledge.” Congress used Smithson’s estate to establish the publicly funded Smithsonian Institution in 1846, which has since grown into an expansive research institute and museum complex that is recognized the world over. Vertebrate paleontology has been an important part of the Smithsonian’s agenda since the beginning, and this article by Ray Rye provides a compelling history of the scientific staff and their research. This post will take a slightly different approach, summarizing the changing public face of Smithsonian paleontology in the form of its genre-defining exhibits. In 1847, Joseph Henry, the Smithsonian’s first secretary, started construction on the original Smithsonian building, which today is colloquially known as “the castle.” The first vertebrate paleontology exhibit housed within its walls consisted of a trio of casted skeletons: the ground sloth Megatherium, the glyptodont Scistopleurum, and the tortoise Collossochelys. These exhibits were probably obtained through Ward’s Natural Science Establishment. The Smithsonian’s first skeletal mount made from original fossils was a Megaloceros, purchased from antiquities dealers Thomas and Sons in 1872. Basilosaurus, Megatherium, and Megaloceros are visible in the southwest court of the first United States National Museum. Image courtesy of the Smithsonian Institution Archives. 1881 saw the completion of the original United States National Museum, next door to the castle (this structure is now called the Arts and Industries Building). The southwest court was dedicated to osteology and paleontology, and the existing skeletal mounts were placed here among rows of cases containing smaller specimens. At this point in time, the Smithsonian had very few permanent staff members, instead relying mostly on scholars serving in unpaid “honorary” positions to curate the growing national collection. Famed paleontologist O.C. Marsh (the beardier half of the “bone wars” rivals) was the honorary curator of vertebrate paleontology. Under contract with the United States Geological Survey, Marsh supervised numerous field expeditions to the American west and oversaw the collection of untold thousands of fossil specimens. 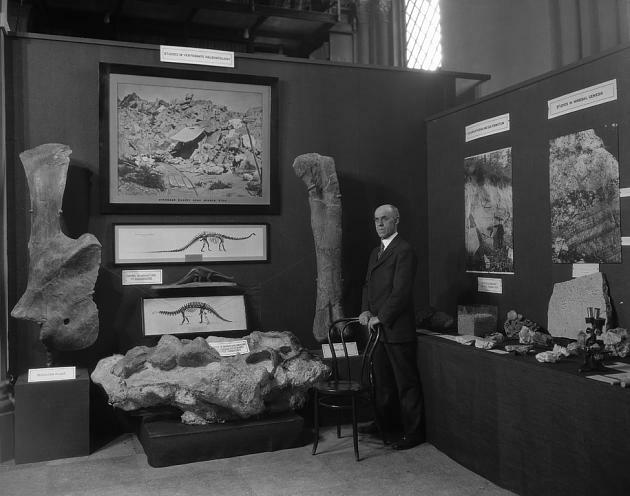 When Marsh died in 1899 the fossils he collected for the government were relocated from Yale University (his home institution) to the Smithsonian. C.W. 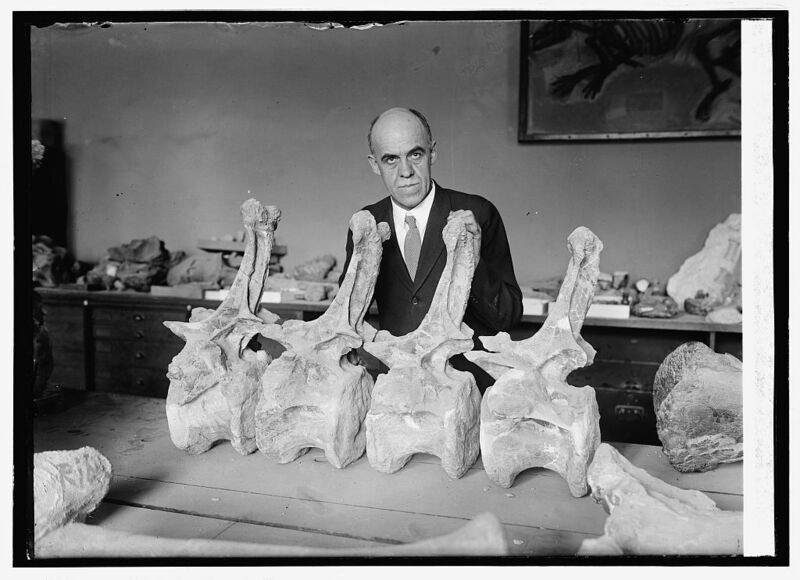 Gilmore with some Diplodocus vertebrae. Image courtesy of the Smithsonian Institution Archives. Charles Whitney Gilmore was a student in mine engineering at the University of Wyoming when he became involved in the Carnegie Museum’s fossil hunting expeditions in 1899. Recognizing the young man’s enthusiasm and talent, John Bell Hatcher hired Gilmore immediately after his graduation in 1901. Gilmore worked with Hatcher for two field seasons, but in 1903 he moved to Washington, DC upon being offered a position as a full-time preparator at the USNM. He was promoted to Curator of Vertebrate Paleontology in 1924, and is fondly remembered as an exceptionally modest but extraordinarily productive scientist. As curator, Gilmore led sixteen fossil-hunting expeditions to the western interior. Gilmore’s most enduring contribution to paleontology, however, is his extensive body of descriptive publications on the Marsh fossils. His monographs on Apatosaurus, Camarasaurus, Ceratosaurus, and many others are still regularly cited today. 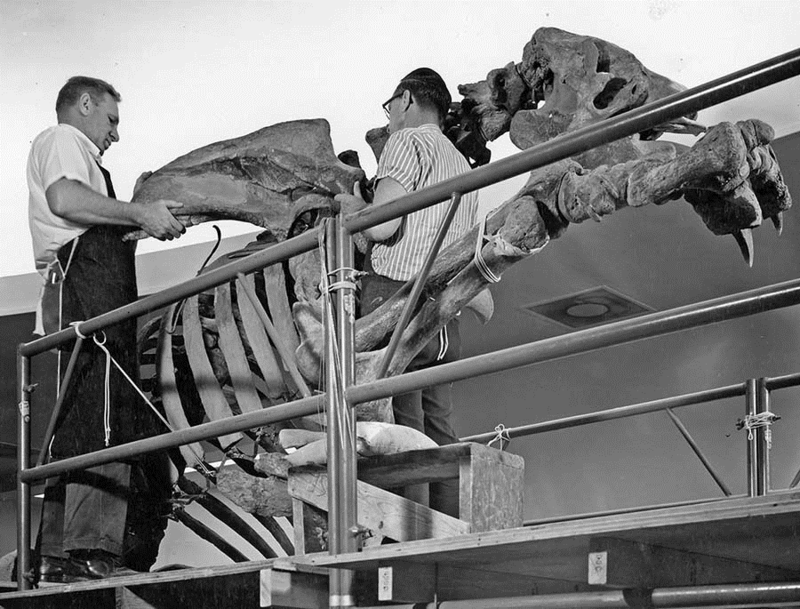 Along with preparators Norman Boss and James Gidley, Gilmore is responsible for creating most of the mounted dinosaur skeletons that are on display at the Smithsonian. 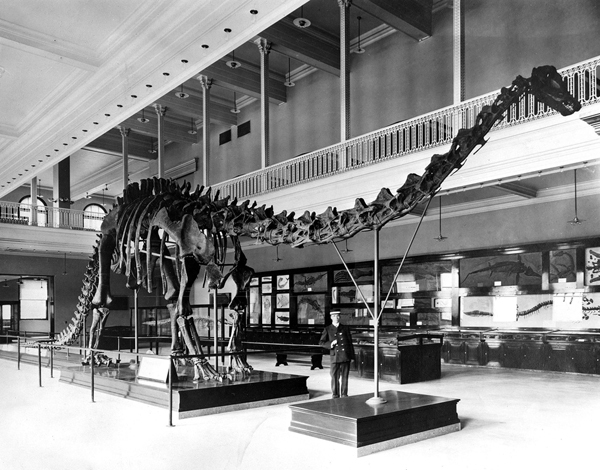 The first dinosaur mount Gilmore and his team completed was Edmontosaurus, which went on display in the original USNM building in 1904. Gilmore would go on to supervise the construction of Triceratops (the first mount of this taxon in the world), Camptosaurus, Stegosaurus, Dimetrodon, Ceratosaurus, Diplodocus, and numerous other displays that have been enjoyed by generations of museum visitors. The Hall of Extinct Monsters, sometime before 1929. Image courtesy of the Smithsonian Institution Archives. Congress authorized the construction of a new United States National Museum on the north side of the National Mall in 1911. In contrast to the Victorian style of the original building, the new museum sported neoclassical granite construction which matched the aesthetic of the other federal buildings. Exactly when the museum opened is the subject of some debate. Collections and offices began moving across the mall via horse and wagon in 1908, and part of the first floor opened to the public on March 17th, 1910. 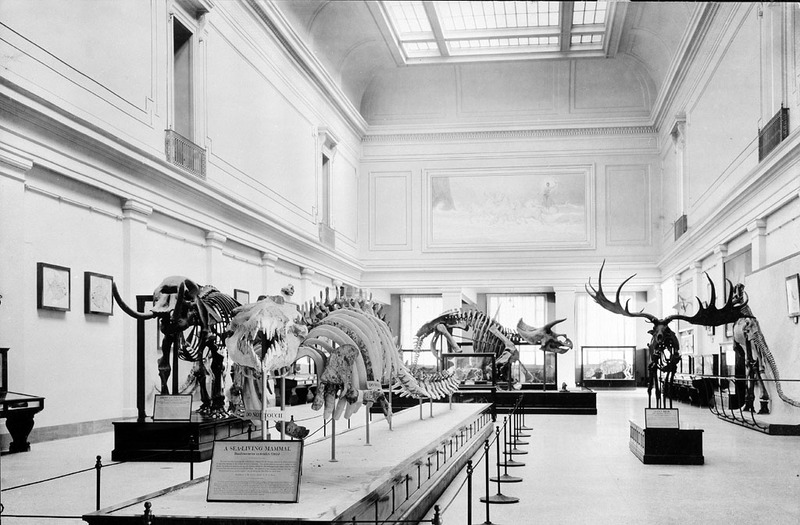 Nevertheless, it was not until 1911 that all the exhibit spaces were ready for visitors, including the evocatively titled “Hall of Extinct Monsters” in the museum’s east wing. 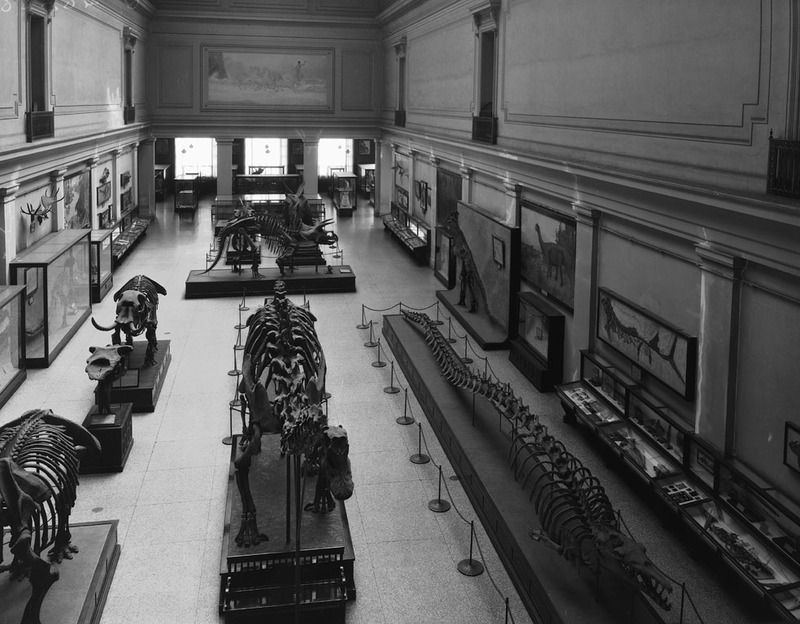 This cavernous space devoted to fossil displays was primarily under Gilmore’s stewardship, and generally resembled a classic “cabinet of curiosity” approach to exhibit design. 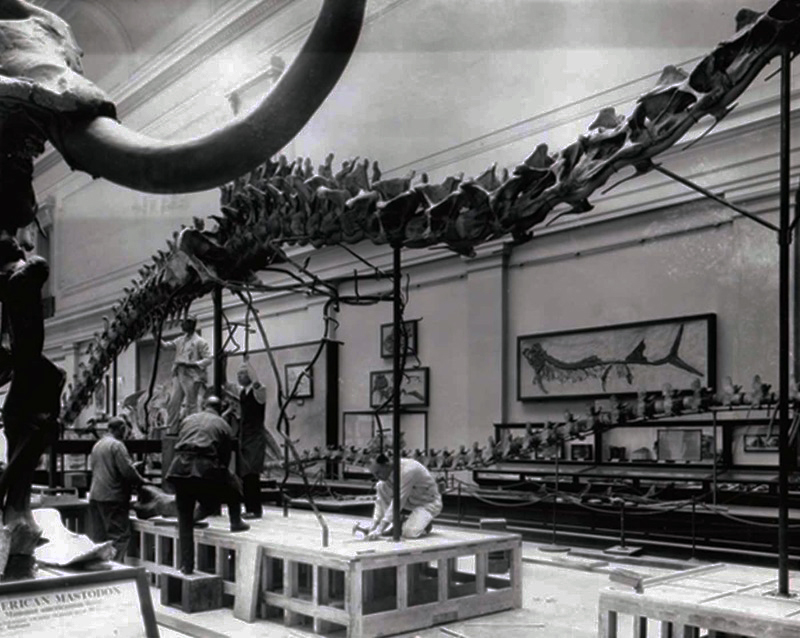 Gilmore and his team would gradually fill the Hall of Extinct Monsters will new specimens over the coming decades, culminating in the towering Diplodocus mount completed in 1932. Gilmore retired in 1945, and vertebrate paleontology research at the USNM, particularly in dinosaurs, quieted in his absence. Charles Gazin, Gilmore’s successor as Curator of Vertebrate Paleontology, specialized in mammals, and the museum remained without a curator specializing in dinosaurs until Matt Carrano was hired in 2003. 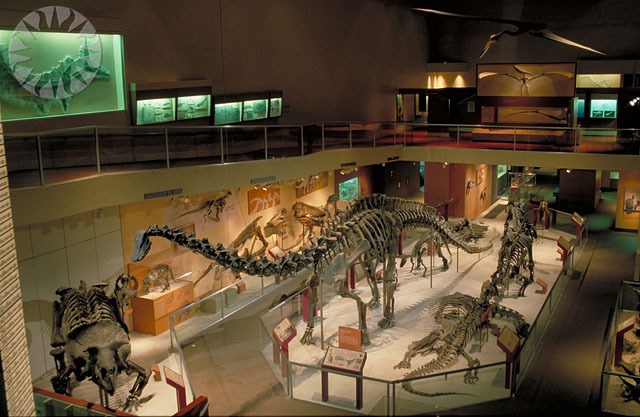 In 1957, the USNM split into two subdivisions, the Museum of Natural History and the Museum of History and Technology. The Smithsonian’s history collections were moved to a new building next door, now called the National Museum of American History, and other collections gradually dispersed into 20-some other Smithsonian museums. The site of the disbanded USNM was officially renamed the National Museum of Natural History in 1967, and remains the home of natural sciences and anthropology. The Hall of Fossil Reptiles lasted from 1962 to 1981. Image courtesy of the Smithsonian Institution Archives. The Hall of Extinct Monsters persisted largely unchanged until 1962, when it was finally renovated as part of a Smithsonian-wide modernization project. The fossil exhibits were among the last to be updated, in part due to ambivalence from the paleontology curators. The department did not employ any staff members exclusively devoted to exhibit work, so the task of reinventing the displays was an added burden for the research staff. As such, the changes to the hall ended up being more cosmetic than structural. The largest mount, Gilmore’s Diplodocus, was too difficult to disassemble and move, so the new exhibit was designed around it. Solid earth tones and wall-to-wall carpet replaced the original neoclassical aesthetic. The John Elliot mural Diana of the Tides, positioned high on the east wall, was simply boarded over during construction (and has remained so ever since). In 1974, the addition of the Hall of Ice Age Mammals and the Rise of Man expanded the paleontology display space beyond the east wing. Further renovations took place in three stages starting in 1979. Entitled “Fossils: The History of Life”, the overhauled exhibit complex represented a significant departure from earlier iterations of this space. While the previous renovation arranged specimens according to taxonomy and curatorial specialties, “The History of Life” followed the evolutionary progression of fossil plants and animals through time. The new exhibits also differed from prior efforts in that they were not put together exclusively by curators. Instead, the design process was led by educators and exhibits specialists, who sought curatorial input at all stages. The new specimens and displays also required the once spacious hall to be carved up into a maze of small rooms and narrow corridors. Even with the additional floor space provided by a new balcony over the dinosaurs, the east wing had become quite crowded. Of course, the science of paleontology has advanced by leaps and bounds since the 1980s, and NMNH staff have made piecemeal updates to the exhibits when possible. These changes include restorations of deteriorating mounts, the addition of a cast of Stan the Tyrannosaurus, and a few revised signs addressing the dinosaurian origin of birds and new dates for geologic time periods. 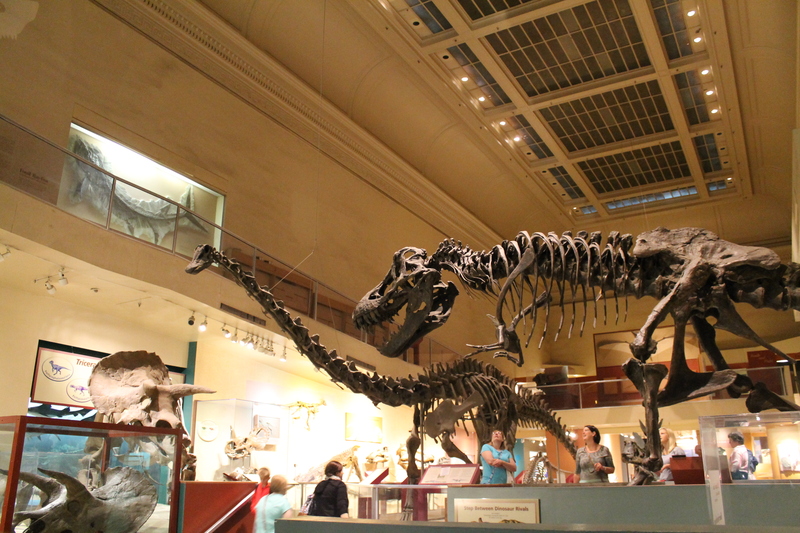 Still, the east wing remained largely the same for over 30 years, and began to look a bit tired next to the brand-new exhibits that have opened at NMNH over the last decade. 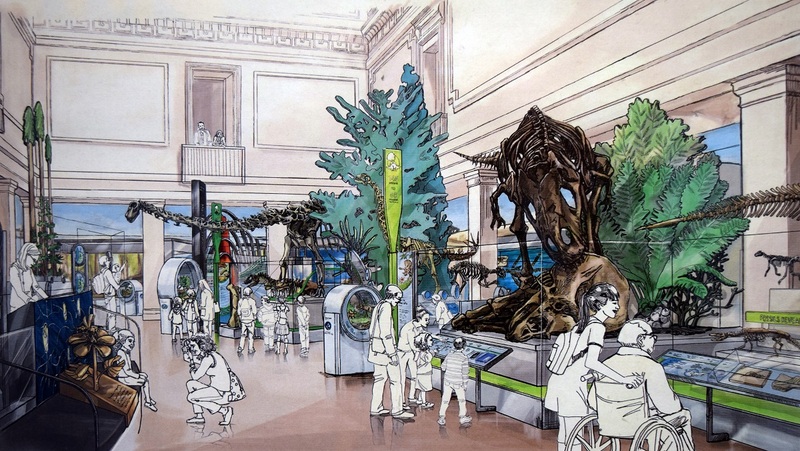 The NMNH fossil halls closed on April 27th, 2014 for a five year renovation project. For the first time, the east wing was completely gutted and its underlying infrastructure overhauled. 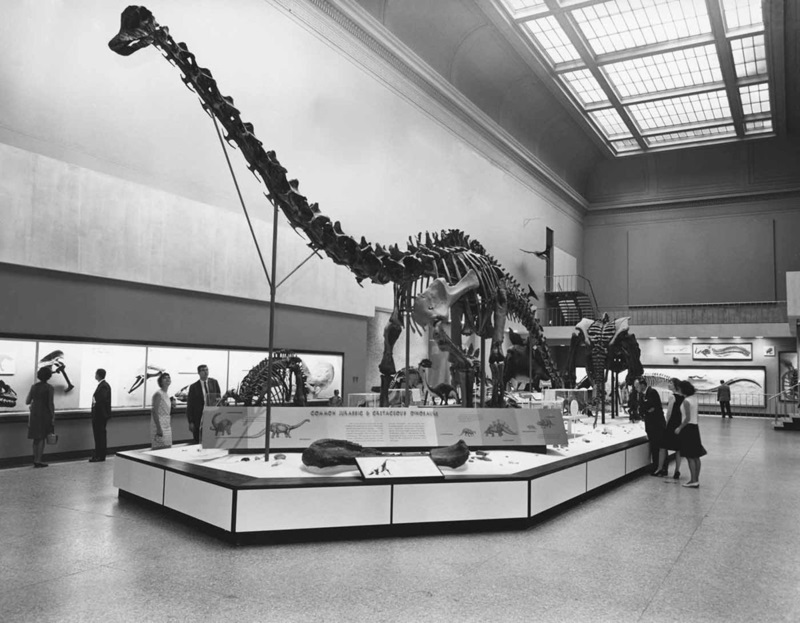 Aging specimens like the 1932 Diplodocus and the 1911 Ceratosaurus were be painstakingly disassembled and conserved, and the space itself was restored to its original Beaux Arts splendor. The re-imagined exhibit is arranged in reverse chronological order: visitors start among mammoths and ground sloths in the Pleistocene and move backward in time through increasingly alien-looking versions of North America. Unlike the present exhibit, however, an open floor plan will allow visitors to get a sense of what they’re in for from the moment they walk into the hall. Mesozoic section of the new Hall of Fossils – Deep Time. Concept art on display in the Last American Dinosaurs exhibit at NMNH. The overall theme is change over geologic time, highlighting the myriad ways that climate, geography, evolution, and other living and nonliving systems interact and shape the world’s environments. Not all the classic mounts will make it into the new space (Brachyceratops, Zygorhiza, and Stegomastodon are among the retirees), but there are many new additions, including the Nation’s T. rex. The result will be a compelling mix of classic early 20th century museum aesthetics and modern visitor-focused educational strategies. Gilmore, C.W. (1941). A History of the Division of Vertebrate Paleontology in the United States National Museum. Proceedings of the United States National Museum No. 90. Yochelson, E.L. (1985). The National Museum of Natural History: 75 Years in the Natural History Building. Washington, DC: Smithsonian Institution Press. The dinosaurs at the National Museum of Natural History. Photo by the author. Easily the best thing about living in the Washington, DC area is the plethora of free, public museums that make up the Smithsonian Institution. Tens of millions converge on the mall each year to this national center of learning, but for locals like myself, these museums are part of the backdrop of our lives. From field trips to rainy days to awkward first dates, the Smithsonian museums are an integral part of the DC experience. Still, I’d wager that I’ve spent more time at the museums than most residents, and the lion’s share of that time has been in the Paleobiology halls at the National Museum of Natural History. When I was very young, my parents supported my interest in dinosaurs by taking me to the Museum at least monthly. Later, stopping at the Museum for a bit of quiet contemplation among the dinosaur mounts would prove irresistible whenever I was nearby. And over the course of two lengthy internships, I still occasionally took the long route across the Museum, cutting through the Paleobiology hall to take another look at the abscess on the pelvis of the Camptosaurus, to check out something I’ve recently read about diplodocoid vertebrae for myself, or even to hear the all-too-familiar narration of the evolution of the horse one more time. In short, these galleries at NMNH have been and continue to be largely responsible for my life-long love of paleontology. They mean a lot to me. It is no secret that NMNH has recently received a generous donation to renovate the Paleontology halls. The exhibits have changed incrementally over the course of my lifetime, including the remounting of at least three specimens and updated signage, but the exhibits are absolutely overdue for a major overhaul. In comparison to the NMNH’s new Ocean Hall and Hall of Human Origins, not to mention newer paleontology exhibits at peer institutions like CMNH and AMNH, the Paleobiology halls look quite tired. What’s more, the science of paleontology has exploded since the last major renovation in 1981, and there is tons of new information to cover. It is an exciting time for the NMNH Paleobiology hall, but looking into this exhibit’s past proves to be just as interesting. From the Smithsonian’s inheritance of fossils from government-funded expeditions of O.C. Marsh to the nationwide rush for dinosaur mounts in the early 20th century, to the dinosaur renaissance of the 1970s, the history of the Paleobiology hall mirrors the history of scientific and popular interest in prehistory over the past century. Many of the specimens in the hall have been on display longer than the NMNH building has existed, and seeing how their physical positioning and interpretation has changed over the years tells a fascinating story about the intersection of science, education and icons of American culture. In this series, I will attempt to tell that story as accurately as I can manage. Notable people and specimens will be introduced, and each iteration of the Paleobiology gallery will be explored. Use this hub to explore the history of the NMNH Paleobiology halls. The following list will become links as the articles are completed. Gilmore, C.W. “The mounted skeleton of Triceratops prorsus.” Proceedings of the United States National Museum 29:433-435, 1905. Gilmore, C.W. “A History of the Division of Vertebrate Paleontology in the United States National Museum.” Proceedings of the United States National Museum 90: 1941.